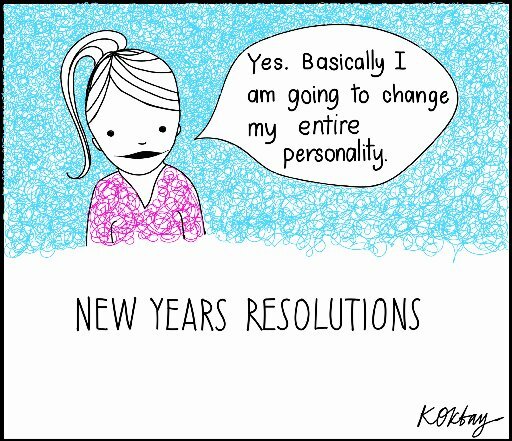 Columnist Kate Oktay breaks down the life-cycle of a New-Years-resolution. Lying under the duvet with a crippling headache as a small child jumps wildly at the foot of the bed, I swear that it will all change. Vague memories of the previous evening resurface between waves of nausea. Me swapping from wine to beer and back to wine again. Me smoking cigars as my husband shakes his head. Me finishing half a litre of guacamole by dipping lamb kofte in it at 3am. This year it is all going to be different. I am going to be different. Different and better. I will be sober, probably for the entire year. And thinner. Much, much thinner. People will come up to me in April with anxious expressions asking if I am eating enough. I will stop swearing altogether and say things like "Oh gosh!" when I slam my fingers in a kitchen drawer. I will meditate daily and gain an inner calm and serenity that will make people secretly hate me. I will drink the correct amount of water and not just water mixed with coffee. I will grow my own vegetables and become a sort of a glowing, healthy, earth-mother type. A new notebook is purchased and the first page is clean and full of promise. I write a page of all the things that will definitely happen every day. Walking, meditation, eating raw vegetables and no drinking. Definitely no drinking. Day four of walking, meditating and sober vegetable eating! I feel amazing. I call friends to tell them how it has all changed. I sense they are both unconvinced and bored, but I pretend not to notice this by talking more and talking more loudly. lot of stomach. "Perfect, yah" he announces to me. "No need to do anything. Kebab diet is good," he says and wanders into the kitchen to eat half a packet of Budget brand biscuits. I feel superior, which is, I am fast discovering, an excellent way to feel. We go out for the day and I miss walking for the first time. But it doesn't matter, I will just go for longer tomorrow. Walking is boring. Really, really boring. The worst of it is looking at other people's manicured shrubbery and realising I have easily the worst garden of any I have walked past in Macandrew Bay. And by now I have walked past a lot of gardens. I remember my commitment to sustainable goddess vegetable growing and decide to start tomorrow. After seven hours of hacking and yanking at weeds, I look around in exhausted animosity. It looks as though after an extended period of time with the worst type of tenants the landlord had finally managed to move them on and had hired the cheapest gardeners for the minimum hours. The stumps of what was my 2.5m-high fennel forest are sticking up aggressively and look like a health and safety risk. I stumble inside to eat what I have started to refer to as "Sad-Salad" as my daughter and my husband eat chips in processed-food happiness on the couch. I try to squash down the feelings of hatred welling up inside. My daughter wants to know when we can have good food again. I reply "probably never" as I put down another bowl of quinoa and raw vegetables and it strikes me that I am turning into the type of person I actively dislike. Instead of walking, I spend more than an hour looking at awkward family photos and taxidermy mice on the internet. It has been three days with no mediating nor walking and I realise my plan to be another person may be failing. I remember last year's New Year's resolution, which was both successful and considerably happier to implement; don't bake cakes. I loved not doing that. "That's it. I'm done," I tell my husband. He is gleeful, but contained as he doesn't want to inflict another week of salad on the family as a result of gloating. I sit on the couch eating ice cream directly from the container and console myself with the thought that while diabetes may be a possibility, at least boring myself and everyone else around me to death probably isn't.